The three major voicebanks of the UTAU speech synthesizer, Utane Uta (the default voice,) Kasane Teto, and Momone Momo are finally featured together in a double-CD. I’m proud that one of my songs was chosen to be part of it. Featuring songs by cinema, DACCHI, daniwellP, inaphon, keisei, Maihime Rikka, mia子, nakano4, polyline, tamaGO, ある調味料, ナノリータP, ミントP, ムジナ, やし, ゆうしゃざこ, りこるP, 不燃物P, 五右衛門, 市蔵, 薄塩指数, 藤本萌々子, 風原, 黒音カツキ and more. Thanks to the illustrators and everyone who worked hard on the project. 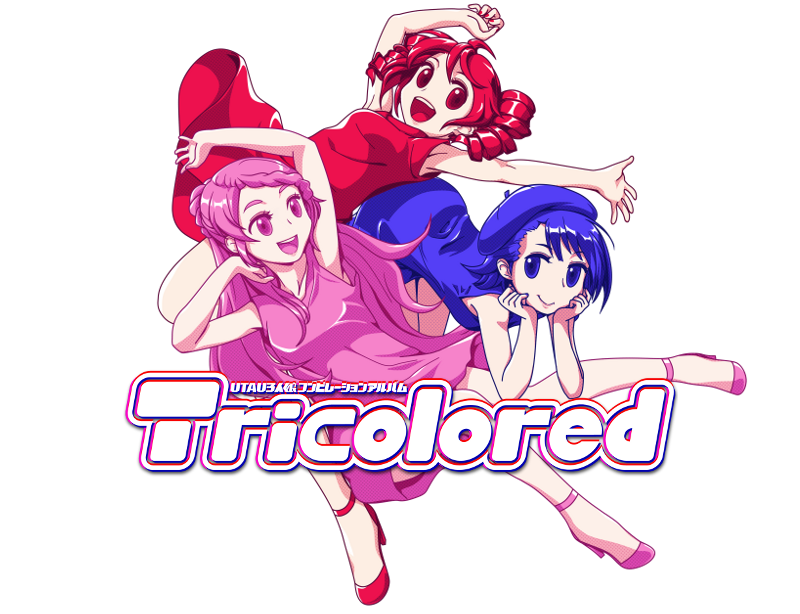 Learn more about it at http://homepage3.nifty.com/st-zako/utau3G_tricolored/ and http://vocadb.net/Al/12301. It can be purchased for mail order via Melonbooks at https://www.melonbooks.co.jp/detail/detail.php?product_id=123619 – you will need a broker for addresses outside Japan. I’m glad to have been a part of this project, a CD sold at an event in Japan. Much thanks to everyone involved for all their hard work. Includes songs by nostraightanswer, CircusP, Xue, Lotte V,Plus/Minus, GowitheBeat, MystSaphyr, Aster Selene, Cdra, donotcrossP, EmpathP, Halo, KANGDAMIN, Kream, Misha, PandaLolii, 赤シャツP, and others. Now that the event is over, it can be purchased via mail order to addresses in Japan though Melonbooks. News regarding rest-of-world distribution is forthcoming. Details will be provided once available.